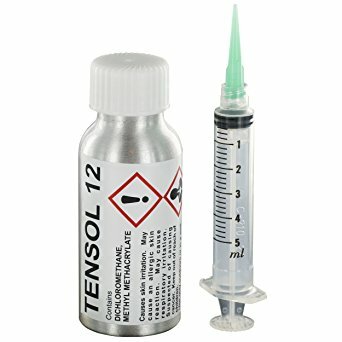 EVO-PLAS Tensol 12 - Two Component Solvent Bourne Adhesive EVO-PLAS TENSOL 12 is a single component solvent based acrylic cement that hardens at room temperature by absoption or evaporation of the solvent, depositing polymer in the joint. In addition he solvent softens the surfaces being joined so that they fuse together, hardening as the solvent migrates into the body material. The product is quickly and easily used direct from the bottle, which is included in the T12 application kit.